This is a picture of Lise and I doing a performance of the transition between the contrasts of heat and death. Yes, I'm doing performance. Reading the BAS book (Sorry about the site I'm linking to not being in English; large parts of the book are, though. ), one of the things I've not been looking very much forward to, is performance, or Action in Space, as it's often called at BAS. Performance always seemed a bit silly to me, and the main teacher at the art school I went to a few years ago, hated it, so I've had a hard time trying to take it seriously (not helped a bit by the illustrations in the BAS book, mind you). However, I'm actually appreciating this course alot. Our Action in Space teacher, Carmen, is doing a good job at connecting the rather abstract actions of performance to thinking about shapes and form, which of course is quite relevant to architects. She's also a choreographer, something I believe is reflected in the assignments we are given, and which also helps the connection from the performance to the real world, because she seems to be thinking in forms, not just in symbols, as many artists do. As mentioned, the picture is from a performance Lise and I did today, illustrating the contrasts (although not opposites) of heat and death. The idea, which was Lise's, was that it would be interesting to use to contrasts that could be found within one object, in this case a warm rock. The assignment was for a pair of people to act out contracts, with one person starting by illustrating a quality like being high, dynamic, organic etc., with the other starting up as more or less the opposite, being low, static, mechanic etc. 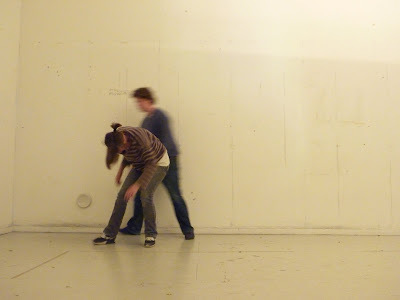 Then, in acts of movement, we were to change places, and by this illustrate a sort of transition. Carmen seemed a bit disappointed that people didn't spend enough time rehearsing the performance, but I guess a lot of people were a bit unsure what to do, as we had been given two and a half hours for this purpose, including lunch (and the sun was shining). I still found the results quite interesting, especially looking at the forms of what people were doing, and I guess that was a part of the purpose. Looking forward to more of this tomorrow.